“Don’t you touch me!” declared Mi Ryang. 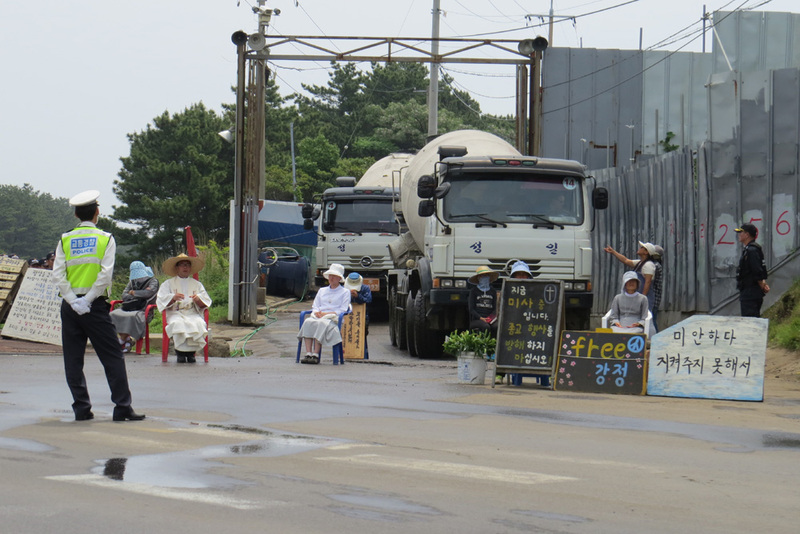 South Korean police were clamping down on a villager who was resisting the construction of a Korean/U.S. naval base at her village. Mi Ryang managed to turn the police away by taking off her blouse and, clad in her bra, walking toward them with her clear warning. Hands off! Mi Ryang is fondly referred to as “Gangjeong’s daughter” by villagers who highly regard her as the feisty descendant of legendary women sea divers. Her mother and grandmother were Haenyo divers who supported their families every day by diving for shellfish. Since 2007, every day without fail, Mi Ryang has stood up to militarists destroying her land. In doing so, she confronts giants: the Korean military, Korean police authority, the U.S. military, and huge corporations, such as Samsung, allied with these armed forces. Mi Ryang and her fellow protesters rely on love and on relationships which help them to continue seeking self-determination, freedom and dignity. Jeju Island is the first place in the world to receive all three UNESCO natural science designations (Biosphere Reserve in 2002, World Natural Heritage in 2007 and Global Geopark in 2010). The military industrial complex, having no interest in securing the Island’s natural wonders, instead serves the U.S. government’s national interest in countering China’s rising economic influence. The U.S. doesn’t want to be number two. The consequences of the U.S. government’s blueprint for ‘total spectrum dominance,’ globally, are violent, and frightening. When the Korean authorities collaborated with the U.S. military in 1947, at least 30,000 Jeju Islanders were massacred. How many more ordinary people and soldiers will suffer, be utilized or be killed due to U.S. geopolitical interests to pivot against China? As many as 20% of all tourists to Jeju Island are Chinese nationals. Clearly, ordinary Jeju citizens and ordinary Chinese can get along, just like ordinary Afghans and citizens from the U.S./NATO countries can get along. But when U.S. military bases are built outside the U.S., the next Osama Bin Ladens will have excuses to plan other September 11th s! 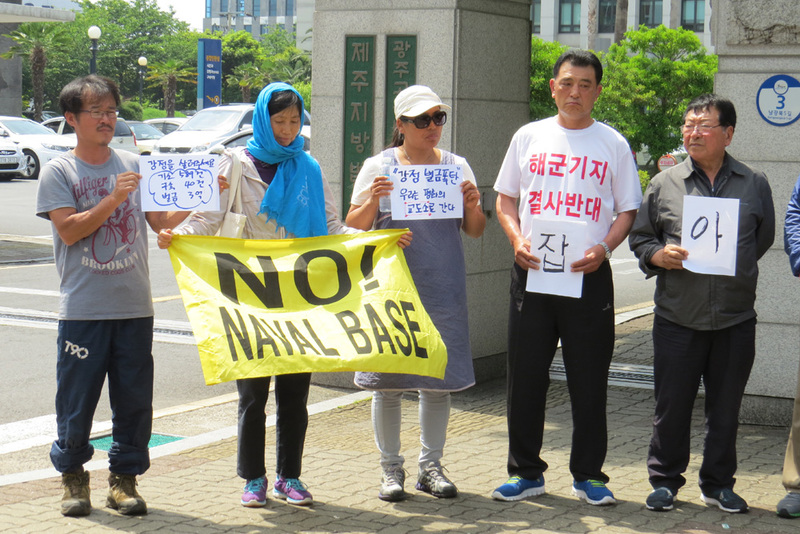 A few nights ago, I spoke with Dr Song, a Korean activist who used to swim every day to Gureombi Rock, a sacred, volcanic rock formation along Gangjeong’s coastline which was destroyed by the naval base construction. At one point, coast guard officials jailed him for trying to reach Gureombi by swimming. Dr. Song just returned from Okinawa, where he met with Japanese who have resisted the U.S. military base in Okinawa for decades. 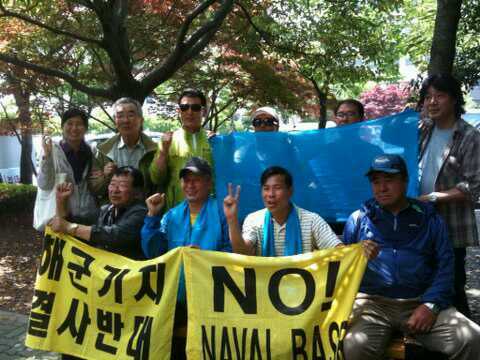 The Okinawan and Korean activists understand the global challenge we face. The 99% must link to form a strong, united 99%. By acting together, we can build a better world, instead of burning out as tiny communities of change. The 1% is way too wealthy and well-resourced in an entrenched system to be stopped by any one village or group. ‘We are many, they are few’ applies more effectively when we stand together. Socially and emotionally, we need one another more than ever, as our existence is threatened by human-engineered climate change, nuclear annihilation and gross socioeconomic inequalities. The governments of South Korea, the Philippines, Vietnam, Taiwan, Japan and even my home country Singapore, have dangerously partnered with the U.S. against China, in Obama’s Asia pivot, dividing human beings by using the threat of armed force, for profit. The non-violent examples of the people of Gangjeong Village should lead people worldwide to make friendships, create conversations, build alternative education systems, promote communally beneficial, sustainable economies , and create peace parks where people can celebrate their art, music, and dancing. Visit Gangjeong Village and you’ll see how residents have created joyful ways to turn the Asia War Pivot into an Asia Peace Pivot, as you can watch in this video. Alternatively, people can choose the “helpless bystander” role and become passive spectators as oppressive global militarism and corporate greed destroy us. 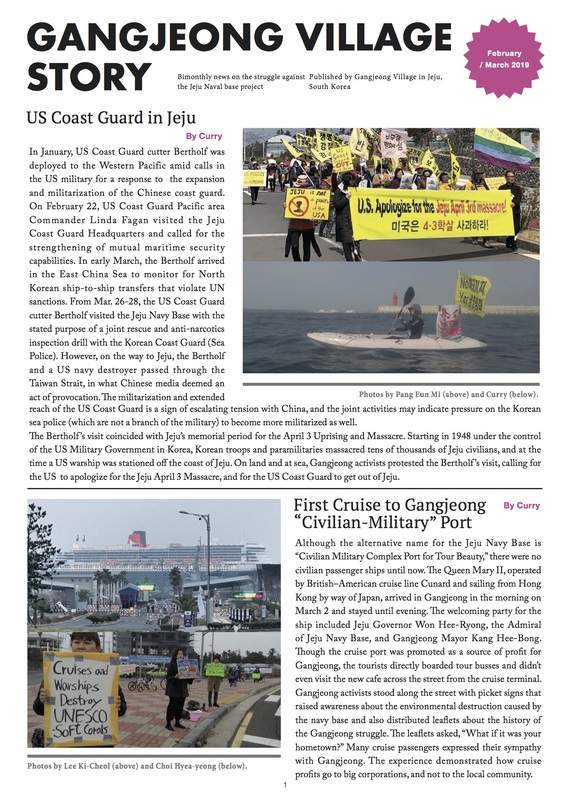 People can stand still and watch destruction of beautiful coral reefs and marine life in Jeju, Australia and other seas; watch livelihoods, like those of Gangjeong and Gaza fishermen, disappear; and watch, mutely, as fellow human beings like Americans, Afghans, Syrians, Libyans, Egyptians, Palestinians. Israelis, Ukranians, Nigerians, Malians, Mexicans, indigenous peoples and many others are killed. Or, we can be Like Mi Ryang. As free and equal human beings we can lay aside our individual concerns and lobbies to unite, cooperatively, making our struggles more attractive and less lonely. Together, we’re more than capable of persuading the world to seek genuine security and liberation. The Afghan Peace Volunteers have begun playing their tiny part in promoting non-violence and serving fellow Afghans in Kabul. As they connect the dots of inequality, global warming and wars, they long to build relationships across all borders, under the same blue sky, in order to save themselves, the earth and humanity. Hakim, ( Dr. Teck Young, Wee ) is a medical doctor from Singapore who has done humanitarian and social enterprise work in Afghanistan for the past 9 years, including being a mentor to the Afghan Peace Volunteers, an inter-ethnic group of young Afghans dedicated to building non-violent alternatives to war. He is the 2012 recipient of the International Pfeffer Peace Prize.